The global human chorionic gonadotropin (hCG) market generated a revenue of $688 million in 2017 and is expected to reach $1,239 million by 2025, registering a CAGR of 7.6% from 2018 to 2025. Human chorionic gonadotropin (hCG) belongs to the family of gonadotropin hormones and is naturally produced by the placenta. hCG hormone plays a pivotal role after the formation of the embryo, and hence has gained significant traction over the years for the treatment of infertility in women and men. hCG triggers ovulation in women and assists in increasing the sperm count in men. The global hCG market is segmented based on technology, therapeutic area, end user, and region. By technology, the market is bifurcated into natural source extraction and recombinant technology. Based on therapeutic area, it is classified into female infertility treatment, oligospermic treatment, male hypogonadism, and others. Depending on end user, it is segregated into fertility clinics, research institutions, and others. Based on region, it is analyzed across North America, Europe, Asia-Pacific, and LAMEA. Rise in the incidence of male hypogonadism among the geriatric population is the key factor driving the market growth. In addition, increase in traction gained by hCG among healthcare professionals and patients would supplement the market growth. However, cautions and warnings issued by the FDA pertaining to the side effects of hCG therapy is expected to hamper the market growth. Moreover, untapped economies are set to offer lucrative opportunities for the expansion of the hCG market. Based on technology, the global human chorionic gonadotropin (hCG) market is bifurcated into natural source extraction and recombinant technology. The natural source extraction segment accounted for a major share in the global market in 2017 and is expected to maintain its dominance throughout the forecast period. The key players operating in the hCG industry exhibit a strong demand for gonadotropins obtained from natural sources, which marks a significant trend in the market over the recent years, which has largely contributed to the revenue generated by this segment. For instance, Sanzyme Ltd. offers gonadotropins that are extracted from natural sources. However, the recombinant technology segment is expected to register the highest growth rate from 2018 to 2025, owing to the availability of recombinant hCGs in different dose strengths, which provides an opportunity for individualized therapy. Depending on therapeutic area, the global human chorionic gonadotropin (hCG) market is categorized into female infertility treatment, oligospermic treatment, male hypogonadism, and others. 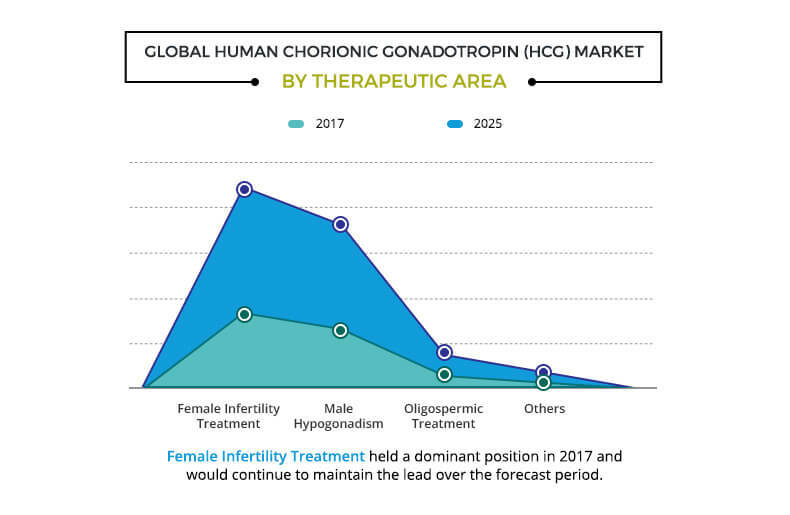 The paradigm shift toward gonadotropin therapy for the treatment of several threatening diseases such as infertility, cryptorchidism, and others is expected to create lucrative opportunities for the expansion of the global hCG market. The female infertility segment dominated the global market in 2017 and is anticipated to remain dominant throughout the forecast period. This is attributed to the rise in infertility-related problems such as polycystic ovary syndrome (PCOS) in females. However, the male hypogonadism segment is expected to grow at the highest rate during the forecast period, due to increase in demand for hCG therapy in males suffering from hypogonadism across the globe. Based on region, the global human chorionic gonadotropin (hCG) market is analyzed across North America, Europe, Asia-Pacific, and LAMEA. North America was the major revenue contributor in 2017 and is anticipated to maintain its dominance throughout the forecast period. This is attributed to significant increase in incidence of infertility-related problems both in male and females. According to the Centers of Disease Control and Prevention, 12.1% of women aged 15&dash;44 years in North America suffer from impaired fecundity annually. Asia-Pacific is expected to possess the maximum market growth rate, due to growth in population, rise in awareness toward heath consciousness, increase in affordability, and improvement in healthcare facilities. The major companies profiled in the report include Bristol Myers Squibb Company, Merck & Co., Inc., Ferring B.V., Fresenius Kabi AG, Cigna, Sun Pharmaceutical Industries Ltd, Lee BioSolutions Inc., Sanzyme, Scripps Laboratories, and Lupin AB. The other players operating in the global human chorionic gonadotropin (hCG) market include Kamiya Biomedical Company, Intas Pharmaceuticals, Prospec-Tany Technogene Ltd., Cipla Limited, Biocare Medical, LLC, MyBioSource, Zydus Cadila, and Life Medicare & Biotech Pvt. Ltd. The study provides an in-depth analysis along with the current trends and future estimations of the global human chorionic gonadotropin (hCG) market to elucidate the imminent investment pockets. An extensive analysis of key segments of the industry is provided to understand the technology and therapeutic area of human chorionic gonadotropin (hCG) applied globally. 8.6. Sun Pharmaceutical Industries Ltd. The adoption of hCG treatment is expected to increase during the forecast period, due to rise in infertile population across the world and growth in awareness toward assisted reproductive technology among the developing countries. Use of recombinant technology in the production of (r-HCG) and rise in adoption of in vitro fertilization in the developing countries are the factors expected to boost the market growth during the forecast period. Other factors such as increase in success rate of hCG therapy in the developing economies across Asia-Pacific such as Malaysia & Thailand, surge in disposable income across the globe, and increase in trend of delayed pregnancies are expected to supplement the market growth in the near future. However, side effects associated with the use of hCG and FDA warnings for its vigorous use in weight loss are expected to hinder the market growth. The key players operating in the human chorionic gonadotropin industry have maintained their market position by expanding their product portfolio through acquisitions. For instance, one of the most popular hCG brands, Pregnyl was originally manufactured by Organon Ltd. and later acquired by Merck. Moreover, vast product portfolio of hCG available in different strengths (concentrations) applied across various treatments of individuals suffering from infertility, high investment in R&D, and strong distribution networks observed by the key players are the factors that fuel the demand for hCG over the years. "Human Chorionic Gonadotropin (hCG) Market"